I’ve been incommunicado for the last 2 weeks when we’ve had the two biggest international jazz shows in Canberra for years. But the alternative was perfectly acceptable: travelling in Vietnam with family and friends. But your intrepid jazz reporter for CJ does not return empty handed. I visited what must be the two major jazz venues in Vietnam: SaxN’art in Ho Chi Minh City (better known as HCMC or Saigon) and a return visit to Minh’s Jazz Club in Hanoi. Both are decorated with bright neon lights, both inside and out, so are hard to miss. SaxN’art was disappointing. It was more a light jazz venue, at least at the time I attended, with an air of 50s sophistication. It was early in the evening, and it may hot up later at night. But a chat I had later in Ha Noi suggests most musos are playing this style, in hotels, bars, etc, for tourists and for the money. (Things are the same the world over, or as the Vietnamese commonly say to tourists, “Same same”). SaxN’Art a two story venue with a dress circle. We were upstairs, so the pic looks down on the band. They were competent players, and I especially liked the bassist. There seems to be a lot of opportunity to sit in in VN jazz venues, and the Vietnamese are a friendly lot. In the case of SaxN'art, there’s a standing open invitation for visiting musos. This time, there were several changes in the one set I heard: one sleek guy singing Sinatra style (“New York, New York” et al. ), and a Korean guitar-singer sitting in for a basic rendition of Stormy Monday blues. Free entry, but prices weren’t cheap, so limit your cocktails when you visit. I have already reported on Minh’s Jazz Club following a visit to Ha Noi a few years ago. I think I saw the house band then, and perhaps they were the same players that night. The band on this night was Red River. It comprised Quyen Thien Dac (tenor sax), Le Thoanh Long (bass), Ha Dinh Huy (drums), Vu Duc Tan (piano). Red River (=Song Hong) is in its second generation, after the leadership was passed from Minh to his son, Duc. This seems so appropriate in this ancestor aware country. I heard that Duc has studied at Berkeley. Whatever, he plays a lovely, melodic, musical tenor sax. His solos can break into faster runs and flourishes, and can break out of tonality, but he works the chords mostly with beautifully chosen intervals to create oh-so-satisfying, cool melodies. He was a pleasure to listen to. The rest of the band was good support. I understand Long, the bassist, is a classical cellist, and his positional playing certainly looked the part. He played with strong, reliable rhythms and walks, but sadly no solos while I was there. Huy, the drummer, is capable and took several solos, and obviously enjoyed his playing. Again, this was professional, competent playing. Tan played a range of styles, from block chords to more interesting soloistic adventures. The tunes I heard were from the standards repertoire: Autumn leaves, Girl from Ipanema, St Thomas, Misty, etc. I would have liked to hear some originals, and apparently they had played some the previous week when they played in concert at the Ha Noi Opera House. But, regardless, I was enthralled by Duc’s excellent sax throughout. St Thomas was great. I always find it a bland number to play, and usually to hear, but this sax was rich and interesting, as Rollins must have meant it. Same same for the others: Ipanema, Autumn leaves, etc. Minh’s is well worth a visit if you’re in town, and especially if Duc is playing. I spoke to the musos afterwards. They remembered visits by various Australians, and repeatedly mentioned the role of the Australian Embassy in promoting tours (here’s an opportunity). They specifically mentioned Scott Tinkler, Mike Nock and Nick McBride, and Neils Rosendahl got a mention too. I visited on the night Herbie Hancock was playing in Canberra, and they pointed out the pic of Herbie playing at Minh’s (apparently he only played one tune). From what I understood, there’s no tertiary jazz training in Vietnam, but there’s interest at the Conservatorium, and Red River comes out of that background. We have now travelled twice in Vietnam with a great tour guide called Tuan Anh of Insight Vietnam Travel http://vietnamtourguides.com/. I’ll put in a promo here: deal direct, get great prices and intelligent, professional service. VN is the first country where I’ve travelled with a tour guide, and it’s so easy (after exploits in Egypt and elsewhere). But more related to CJ, it also turns out that Tuan’s wife, Hong Dung, is a professional singer on the Ha Noi scene. She knows Minh and the jazz scene, but works more in the “corporate” area. (Ya gotta make a living). As for travel, feel free to contact Eric at CJ if you want a reference for Tuan’s company. And one last observation. Air Vietnam currently have Miles/Coltrane and Mingus as background music during boarding. On the other hand, JetStar (a perfect example of a commercially successful, modern, low cost airline) has some inane, endlessly-repeating clip from some catchy pop tune with the lyric “fly away”. Sadly, you’re more likely to travel JetStar. I'm out of town and I've bagged the quinella. 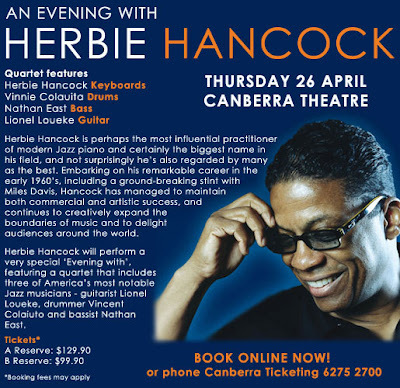 Herbie H is the second international gig to hit Canberra this month, and I've missed them both. Herbie Hancock played with Vinnie Colauita (drums), Nathan East (bass) and Lionel Loueke (guitar). Again, I invite your comments. Over to you. Add your comments below this CJ Blog post. 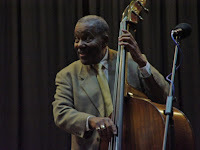 "Senator" Eugene Wright was Brubeck's bassist on the Take 5 sessions and a stalwart of the LA jazz scene who played with many other influential jazzers. He's just played at White Eagle with Anita Thomas (reeds), Mike Price (guitar) and Mark Sutton (drums). I couldn't make the gig, so I invite your input. Add your comments below. Over to you. If you have pics, send to me for later publication. Thanks to those who left comments. More welcome. Looks like I missed a great show. Thanks esp to Luba Thompson for the great review and these pics. White Eagle offered another double bill last night. This is obviously developing as the nature of the event, with audio provided and recorded by ArtSound, and a local band and a local or visiting band as a main act. Tonight’s show featured Ivory Hunter, Daniel Hunter’s band, and the return of Sydney’s Trio Apoplectic. Ivory Hunter is led by Dan Hunter (guitar), with Yen Nguyen (drums), Gareth Hill (bass) and Munro Melano (keyboards). I hadn’t heard of Ivory Hunter before but I assume the musos have been playing together for years at the Jazz School. I’ve reported on these players several times on CJ, but mostly they were playing the standards repertoire (very capably). However, Ivory Hunter is a platform for originals. The tunes were penned by various band members and covered a range of approaches. There was one bordering on hardbop, but mostly they were more melodic and tuneful. I particularly liked a couple of tunes from Gareth, a ballad and another tune with a very convulsive melody leading into a hard swing. Daniel’s Act of will was an interesting piece with a sustained quarter-note melody that had my mind drifting. And I have to mention Dan’s Scofeel. It’s an obvious take on Scofield, with indefinite timing, sleezy down-South solos, bluesy organ in the background, and Chambers-style drum patterns crossing the bar lines. So there was quite a range of styles here: floating and relaxed, bluesy, out. I had the feeling these guys were beyond simple exuberance, and were seeking more musical statements. Daniel always plays in a restrained and careful way, and he did so this night. He plays occasional flourishes but lots of well-considered melodic lines. Gareth also led as melodist on several tunes and played some excellent solos. He’s a strong player, and his tone is also strong: good muscular fingers dragging the strings for a clear, woody tone. Munro played synths at times, along with piano and organ sounds. I particularly liked his comping, especially following his responses to Dan when he played outside. Yen held it all together and played several expressive solos, not least on his own compositions. As for the band name, Hunter is an obvious reference, but is there some other message? Perhaps. The smooth surface and alabaster colouring of ivory seems to fit the music. Trio Apoplectic were quite a change after the more relaxed Ivory. Right from the top, they played with intensity, energy and intelligent interaction. I’ve written about TA before; they played at the first White Eagle session. Their return was quite triumphant. This was modern jazz of a high order. 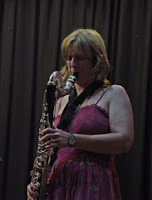 Intellectual, emotionally demanding and satisfying, great playing with great, clear sounds, exploratory. I love this style and I was trying to place it. Perhaps Joe Henderson? I asked them about their influences. Interestingly, they offered Bernie (McGann) and when I further inquired, they suggested other players around Sydney. TA are Dave Jackson (alto sax), Abel Cross (bass) and Alex Masso (drums). They play a mix of standards and originals. Originals come from the pens of Alex and Abel, especially Abel. They played Monk’s Boo Boo’s birthday. Originals included the oddly named Details of how to get apoplectic on your licence plate (apparently a renowned title at Sydney’s Birdland records). There were soundscapes and free styles, hard swing and balladic styles, bowed bass reminiscent of didjeridoo and sax harmonics. Several of these tunes are on the CD, and were played at TA’s last White Eagle concert. I feel they’ve explored the music much further, and this was the source of such a satisfying performance. They all played with intense energy and commitment throughout the show. Noone played too obviously, or displayed the chords too evidently. The harmonies and counterpoint were fascinating. They were also all very balanced, each player providing an essential ingredient and contributing equally to the complexity and richness. This is just highlighted by the open sound a chordless trio. Dave plays alto, and it fit so well: smooth and sinuous, but also intriguing and exploratory. Abel played hot from the top, and played some excellent solos. The underlying chords were interpreted so subtly I wondered if the tunes were modal. A lovely modern style. Alex was mobile and varied on drums: brushes or sticks, cymbals or drums, sparse or dense. Another great night at White Eagle, in expectation of White Eagle’s debut as an international venue next week, with the bassist Senator Eugene Wright. You may know that Kevin Hunt is the first Musician in Residence at ArtSound. I imagine the relationship is a little ill-defined or at least pretty variable to suit both parties, but it’s an excellent idea, and I saw one hugely productive aspect of it today. Kevin Hunt has an interest in classical (especially French) music of the era of Ravel and Debussy. Apparently, his masters thesis was a study of this music and its interpretation in a jazz format. For this, he worked with Gary Holgate (bass) and Lawrie Thomson (drums), and he has recently performed this repertoire at the Adelaide Festival of Arts, and is due for a performance in Canberra (Southern Cross Club, Thurs 19 April). So this is a labour of love, as it would need to be for it is complex music. It must have involved plenty of investigation and reinterpretation to the jazz idiom. I saw some bass charts and they were deceptively simple, but the music was complex and rich, and vibrant in classical, jazz and occasionally blues forms. The session was the second day of an open house recording session. The first day was spent on setting up mics, equipment and a workable mix, as well as refining arrangements. The second and third days are for recording, and there will be mix-down and mastering sometime in the future. This second day saw the trio recording Kevin’s interpretation of movements 1 and 3 of Ravel’s Valse noble et sentimentale, movements 1 and 3 of Debussy’s Suite Bergamasque (no. 3 is “Claire de Lune”) and Gershwin’s Rhapsody in blue. The interpretations were fascinating. Kevin explained that he maintained the structure of the pieces, but he often rephrased famous lines or reharmonised in a jazz format, or broke into solos sections which were influenced by the original but not just imposed on the original piece. Kevin also showed himself as a great teacher in this process. He explained the approach to the students present, and took a real interest in their experiences and development. So it was much more than just a recording session; it was also an effective training workshop. So, we heard that Ravel’s work comprised 7#9 > min > dom/maj7 movements at one stage; how the flourish at the intro to Rhapsody in blue covers the full range of the clarinet, and how Kevin approached its replacement in this reinterpretation; the extent of the “heavy reconstruction”; the application of jazz minds to classical forms, and so on. It was a fascinating discussion to accompany the engaging performances. I was also interested in the recording processes. Tony Hunter was the engineer for the session. The equipment is excellent, and the result will no doubt be professional. Mics included Neumann, AKG, Shure, Rode. The mixer is a digital Yamaha (DM1000) with Cubase SX and Genelec monitors. All top stuff. It was also quite a stunning change to move from the mixing room, with its precise and clinical sound to the live room with a loud Yamaha 7-foot grand piano in action. But all fascinating and educational. From left, Liena Lacey (classical piano), Reuben Lewis (jazz trumpet), Olivia Henderson (jazz piano); students at the ANU School of Music. Congrats to Kevin, Gary and Lawrie for the intriguing, impressionistic music, and to ArtSound for the inauguration of their musician-in-residence program. 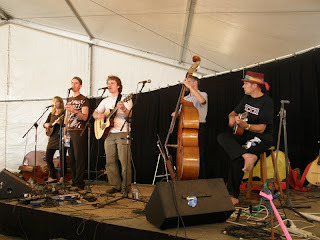 Canberra stages the National Folk Festival each Easter. It’s now in it’s 41st year, and it’s a big event (17 stages listed in the program). I sing tenor in the Dante Musica Viva (Italian) choir. DMV performed there this year, so I got free entry. We also got the biggest PA on the largest stage, although just at a warm-up time. We mainly sang Italian traditional tunes along with several songs of WW2 partisans. The songs are incredibly infectious, sometimes cocky and occasionally emotional, and this choir enjoys itself and lifts in performances. So it was fun. I roved around the event in the afternoon. There were lots of ethnic dancers (including the jangly Morris Men) and earnest singer songwriters, but several capable blues players interested me. There’s bound to be something for any taste at such a large event. At a previous festival, I remember the find was a very capable Scottish guitarist chatting about Mingus and playing Goodbye Pork Pie Hat. This year’s find was a band that announced they were a cross of Irish and Hungarian. This was interesting, especially given they started with a tango. But they were competent and played some original or otherwise well-chosen tunes, and featured two (!) bassists, along with four part harmonies, and the very strong lead voice of Ben Palumbo. The band was Urban eXcentrics. Well worth a listen. I caught the Dave Rodriguez Trio today at one of their regular weekly gigs at the Belgian Beer Tavern in Kingston. Presumably the audience was of local apartment dwellers from rapidly urbanising Kingston. They were thirty-ish, predominantly wearing black, and included several parents with well-behaved toddlers or proud dads holding their very young offspring. So it was a pleasant if inattentive crowd for the band to entertain. The beer was authentic Belgian and on tap, and there was a general hubbub of quiet afternoon socialising. And it was a lazy, cool but sunny, autumn Easter Sunday afternoon. So a trio playing standards was absolutely par for the course, and Dave’s band did the job with aplomb. The tunes were Green Dolphin Street, Darn that dream, There will never be another you, My funny valentine, and the like. It was lovely music, and well played, and obviously enjoyed. They all took plenty of solos, and played with understated verve. But it remained soft and sweet, gentle and restrained, as fits with this audience, and this time. The Trio is Dave Rodriguez (guitar), Ed Rodrigues (drums) and Bill Williams (bass). Dave played largely diatonic solos with a clear, jazz sound. He threw in chords in several solos and played plenty of introductory vamps. Mostly good, solid, clear interpretations of the tunes, with occasional atonal explorations. Ed played brushes most of the time, displaying a flamboyant intensity which seems to me to be a trademark of his playing. Bill showed that calm attention which is so valuable in a bassist, freeing you to make all the changes and hold the steadiness of a walk or a rhythmic pattern. So, it was a lovely, restrained gig with much loved standards. The Dave Rodriguez Trio plays 2-5pm Saturdays, at the Belgian Beer Tavern, Kingston (opp. Green Square). Free entry, interesting beers and coffee.